A federal tax on boats worth $100,000 or more was taken off the books years ago but boaters are still assessed a property tax by the state and must pay registration fees. Federal luxury tax was repealed almost 25 years ago but the government still earns some money from boaters. STATEWIDE — Boaters have lived without a federal luxury tax for new vessel purchases for almost 25 years now. But just because you do not have to fork over a hefty fee to the feds whenever you buy a new boat of $100,000 or more does not mean there aren’t other taxes and fees to chip away from the money in your bank account. Sales and use taxes for boat purchases in California can range from 7.5 to 10 percent, according to BoatUS. The taxes do not end once you assume ownership of your new or used boat. In addition to registration fees (assessed after purchase or if the boat has been in California for more than 120 days) you will be subject to an annual property tax if you dock your boat in California. In this piece, The Log takes a quick snapshot of property taxes and registration requirements for boat owners in California. We also provide a little history of the short-lived federal luxury tax on boats and a tax credit proposed by a Kennedy (but never became law). Tangible property is considered taxable under the California Constitution. “If it flies or floats, it’s assessed for property taxes,” reads a statement on the San Diego County Assessor’s Office website. California began taxing recreational boats annually since 1997, when the state passed a law requiring a vessel to be taxed based upon where it is regularly docked. The value of a vessel, for assessment purposes, is determined by reviewing the annual sales of comparable boats. “If a boat … is built by the owner, the cost of construction is then used as the basis for determining its value,” the San Diego County Assessor’s Office stated on its website. Your boat will be assessed a property tax if it is up for sale and consigned to a broker. 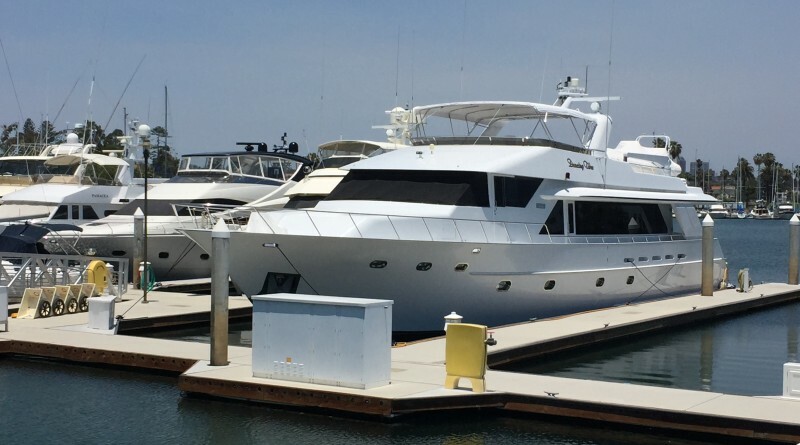 However a boat on the market is exempt from property taxes if a licensed dealer, according to the San Diego County Assessor’s Office, holds it in inventory for sale. Of course property tax rates vary depending on where you dock. The property tax rate ranges from 1.050 percent in Coronado, for example, to 1.174 percent in San Diego. National City’s property tax rate is 1.134 percent while Oceanside’s is 1.083 percent, according to San Diego County’s Office of Property Tax Services. Sailboats larger than 8 feet in length and all powerboats used in California waters and not documented by the U.S. Coast Guard are subject to registration requirements with the Department of Motor Vehicles (DMV). If you have a boat registered elsewhere (another state or country) it must be registered in California if it will remain within the state for at least 120 days from when the vessel was brought here and used in the state’s waters a majority of time. Some vessels are exempt from California registrations laws, such as a craft solely powered by oars or paddles, sailboats smaller than 8 feet, non-motorized sail-surf boards, a ship’s lifeboat, or a boat brought into California for racing purposes only. A boat lawfully and currently registered in another state or country and principally used outside of California is also exempt from the state’s registration requirements. Dinghies are not considered lifeboats and would be subject to a registration requirement in California, according to the DMV. A federal luxury tax on new boats was approved on Sept. 30, 1990. Anyone who purchased a brand new recreational boat, worth $100,000 or more, after that date would be assessed a 10 percent federal tax (in addition to local and state taxes and fees). Purchases of used recreational boats were exempt from the tax. Say a boater who purchased a new $500,000 recreational boat. He or she would have to pay $40,000 in federal taxes. This would be on top of $30,000 in state taxes (6 percent rate in 1991) and county sales tax rates. The boating industry did not respond well to the federal tax, according to news reports. A story in The Baltimore Sun on June 9, 1991 stated new boat sales fell by 56 percent one month after the tax was implemented. In 1992 President George H. W. Bush proposed repealing the federal luxury tax on recreational boats. “Since the tax took effect in January 1990, hundreds of builders of large and small boats have spoken of it as a stake driven into the heart of an industry already suffering from the recession, tighter bank rules on financing and fallout from the Gulf War,” Agis Salpukas, a New York Times reporter, wrote in an article on Feb. 7, 1992. “In the last two years, about 100 builders of luxury boats –recreational craft costing more than $100,000 –cut their operations severely and laid off thousands of workers. Some builders filed for protection from creditors under Chapter 11 of the Federal Bankruptcy Code,” he continued. The recreational boat luxury tax was repealed in 1993. In 1999 Washington Post reported the boating industry lost 7,600 jobs because of the luxury tax. Six years after the luxury tax on recreational boats was repealed the House of Representatives boomeranged back with a pendulum swing in the opposite direction. Rep. Patrick Kennedy (D-Rhode Island) introduced the Boat Building Investment Act (H.R. 677), which was sort of a trickle-down economic response to the luxury tax on recreational boat sales. Kennedy’s proposal offered a 20 percent tax credit – up to $2 million – to anyone purchasing a new yacht (50 feet and longer). The bill, introduced in Feb. 1999, was never enacted, but Will stated H.R. 677 would help revitalize the boating industry. Great story! Thanks for Mr. Rohit’s deep look into a topic that boaters may not always understand. Another concern is the deduction allowed for interest on a boat loan. In 1984, BoatU.S. first argued that recreational boats should be treated under the tax code the same way as second homes and recreational vehicles, convincing Congress to retain the IRS interest deduction for boat loans. Over the years, the issue has risen again but with boat owners speaking up, we’ve been able to stop such legislation. Factually inaccurate about when CA started doing property tax assessment. When one fact is wrong, I always believe all the others are as well.